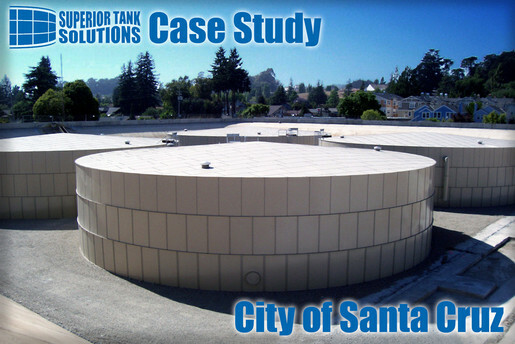 The City of Santa Cruz faced an issue with water stratification as well as high Disinfection By-Products (DBP’s) levels after changing from ground water to surface water. The thermal stratification led to insufficient disinfectant circulation throughout the tank. The lower circulation, lower residual levels and the change in water source resulted in increased consumption of disinfectant leading to higher levels of DBPs formed during the disinfection process. The site affected by the change houses four 1,500,000 gallon potable water storage tanks manufactured by Superior Tank Co., Inc.
To reduce operating costs, improve water quality and ensure EPA compliance for DBP levels the City implemented a pilot program to compare the different industry leading in tank active mixing and DBP removal systems. 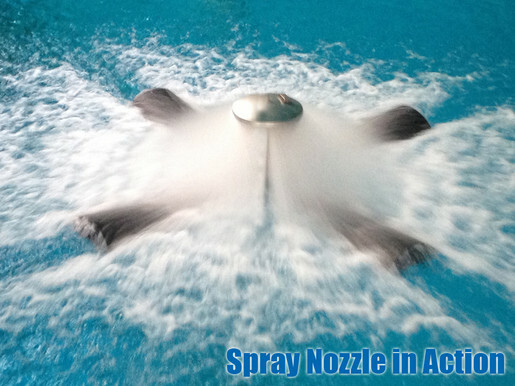 After comparing several products the City selected a system consisting of a floating spray nozzle and associated stratification elimination equipment. Since installing this system the City has achieved a 40% reduction in DBP and dramatically improved disinfectant mixing with excellent operating cost efficiency. Superior Tank Solutions supplies and installs a full range of mixing and DBP elimination systems custom designed to your specific needs. Call to see how Superior Tank Solutions can reduce your operating costs and improve your water quality.